This is not a way to play cylinders - it is a way to play cylinder moulds. It was developed as a way to play the contents of the Berlin Phonogramm-Archiv, which holds one of the world's greatest collections of cylinders with traditional music in original recordings from all over the world from 1893 to 1943. In the upheaval at the end of World War II, in late 1944 the collection disappeared, evacuated for security reasons. Only about 1/10 was returned to the West, the rest, we now know, was in the Leningrad Phonogram Archive (present-day St. Petersburg) and was brought to East Berlin in the 1950s. In 1991, after the reunification of Germany, the collection was returned to the Musical Ethnology department of the Ethnographical Museum, the successor of the former Phonogramm-Archiv. As a means to preserve the fragile recordings, copper negatives, so called galvanos, were made from the original wax cylinders by galvanisation. These galvanos served as masters for new copies to be played and exchanged with other institutions. A long time has passed, and today cylinder moulding is a very time-consuming process and even impossible for some of the galvanos, damaged by time and travel. At the GFaI (Gesellschaft zur Förderung angewandter Informatik e.V.) in Berlin, the SpuBiTo project (groove-image-sound) has developed a method for playing the galvanos directly. 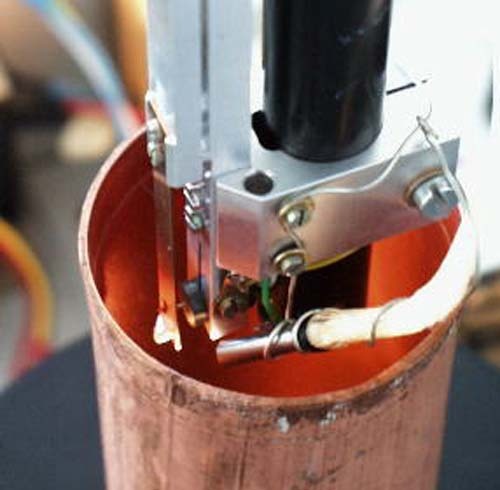 Professor Gerd Stanke and Thomas Kessler have built a player with a mechanical sensor that plays the rows of bulges that constitute the negative image of the cylinder. The head of the player is seen in the image above, inserted into a galvano. It has a mechanical sensor that is kept on track by an image processing system. From the obtained profile the sound is then reconstructed. The cylinders are played at slow speed, the goal at the moment is to reach 1/10 of the recording speed. Work is now continued by Thomas Kessler. 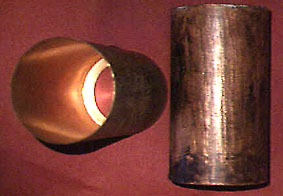 Two of the galvanos, cylinder moulds, as found today in the Museum für Völkerkunde in Berlin. A photograph of the inside of one of the galvanos. What we see are not the indented tracks of a phonograph cylinder, but their raised imprints in the metal. 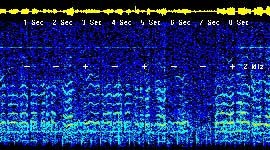 A spectrogram of a part of one of the galvanos (male chant, Ceylon 1907). The sound can be heard at GFaI, see the link below. 3D Measurement and modelling in cultural applications, by Gerd Stanke and Lothar Paul (Information Services & Use 15 (1995), pp. 289 - 301). From Wax Cylinders to Digital Storage: The Berlin Phonogramm Archiv Today, by Susanne Ziegler (Resound: A Quarterly of the Archive of Traditional Music, vol. 13, No. 1/2, Jan/March 1994).